Yogurt Black Sticky Rice Pudding (Sua Chua Nep Cam) is a beloved dessert of people of all ages in Vietnam. The tartness of yogurt combining with the light sweetness and richness of soft-chewy black sticky rice can cool you down quickly on hot summer days. It is easy, delicious and healthy. 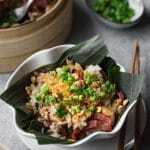 In the Steamed Peanut Sticky Rice with Coconut Milk recipe, I mentioned that we ate sticky rice extensively in Vietnam, and the rice can be used to make both savory and sweet dishes. 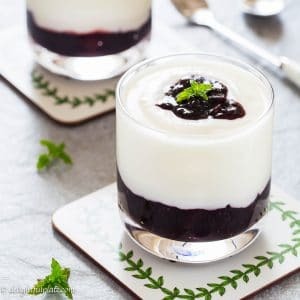 The Yogurt Black Sticky Rice Pudding (Sua Chua Nep Cam in Vietnamese) is one of the most popular sweet dishes made from sticky rice in my home country. What is black sticky rice? Black sticky rice has some other names such as black glutinous rice and black sweet rice. Its name in Vietnamese is gao nep cam (or gao nep than). It is a long-grain rice with uneven colors. Overall, I would say it has a dark purple color, and you can see that very clearly after soaking or cooking it. 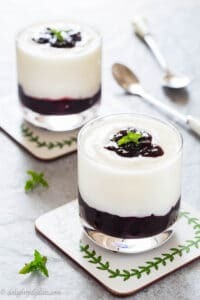 The contrast between its dark purple color and the creamy white color of yogurt creates such a striking visual effect for this dessert. Black sticky rice has the same texture as regular sticky rice. It’s soft, sticky and slightly chewy once cooked. In terms of flavors, it also has the light sweetness similar to the regular one. 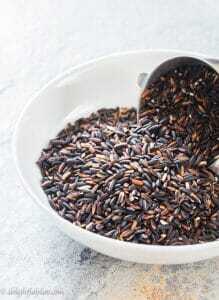 Besides, black sticky rice has a nutty and rich flavor, and its fragrance is also stronger than regular sticky rice. Some articles say that black sticky rice is a nutritious grain. It is rich in protein, antioxidants, dietary fiber, and iron. It may have anti-inflammatory effects and benefits for heart health. Adding it to our diet sounds like a good idea right? 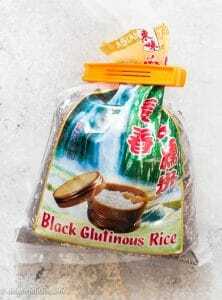 This article “Health and Benefits of Black Glutinous Rice” lists some of its health benefits. You can find black sticky rice at Asian grocery stores, and here is the pack I bought at mine. The first way to enjoy it is to make black sticky rice pudding. You can then add yogurt, mix and indulge in the heavenly creamy and rich dessert. 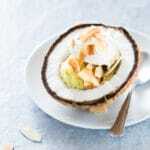 Another way you can eat the pudding is to pour some coconut milk over it and eat right away. The second way we eat this grain is fermenting it with the aid of yeast. We call it black glutinous rice wine (ruou nep cam). It is mildly alcoholic, and we ritually eat it in May each year to cleanse our stomachs. And of course, we can make steamed sticky rice from this grain. 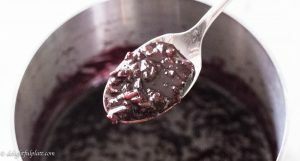 Cooking black sticky rice pudding is easy and straightforward. You only need a regular pot/saucepan to make the rice pudding. The first thing you need to do is to soak the rice for at least 4 hours. Soaking ensures you will achieve the perfect texture in the shortest amount of time. When I was in a hurry and only soaked it for 2 hours, my cooking time increased by at least 5 minutes. After soaking, you just simply simmer it with water until the rice is soft and the rice pudding is glossy and thick to your liking. I simmer the rice with pandan leaves to add some extra aroma, but it is optional. 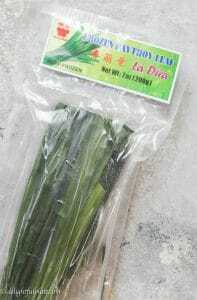 You can find frozen pandan leaves at Asian grocery stores. The pack I got will last for quite a while. If you cannot find it, just add some vanilla extract. Once the black sticky rice pudding is ready, you just need to let it cool and then mix in plain yogurt. The ratio I like is 1 part black sticky rice pudding and 2 parts yogurt, but it’s totally customizable. You can add crushed ice and honey depending on your preference. I guarantee that this yogurt black sticky rice pudding is super addictive. Mr. Delightful Plate and I can eat 24 oz. of plain yogurt with black sticky rice in one sitting. 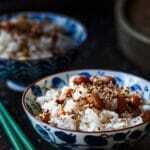 Another interesting Vietnamese recipe that uses yogurt is this Yogurt Coffee (Sua Chua Cafe). I think you will also like it. Yogurt Black Sticky Rice Pudding is an easy, delicious and healthy dessert, which can be whipped up quickly. The tartness of yogurt combining with the light sweetness, creaminess and richness of soft-chewy black sticky rice can be addictive. Wash black sticky rice and soak for 4-6 hours. If you soak it for a shorter amount of time or skip this step, you will need to increase the cooking time. After soaking, rinse rice and put in a pot. Tie pandas leaves into a knot, put in the same pot. Add salt and water, bring to a boil. Reduce to low - medium-low heat, cover and cook for 20 minutes. After 20 minutes, add honey, stir and then cover, cook for 5-10 more minutes or until rice is soft and the pudding is glossy and thick as you like. Transfer to a bowl and let it cool to room temperature. Whisk yogurt until smooth. 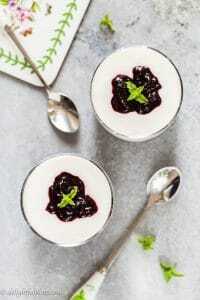 Put 1 part black sticky rice pudding and 2 parts yogurt in serving glasses or bowls. The ratio of rice pudding and yogurt is customizable. Add crushed ice and honey if desire. Hi Sophie. Im thrilled to have found your site. My family and I have just returned from our first visit to beautiful Vietnam (March/April 2018) We came across black sticky rice not only in Hanoi but also in Ho Chi Minh city as well as Hoi An, We could not get enough of it. Wow, the dessert is so good. We will definitely be making and trying out your recipes. Thank you so much for leaving me a comment! I’m glad to know your family tried black sticky rice and liked it. 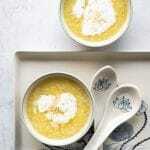 If you try out my other recipes, feel free to let me know what you think about them. March/April is a good time to visit Vietnam. Hoi An is actually one of my favorite cities in Vietnam. I haven’t been back there for almost 5 years now, but I’m planning to spend a few days there this September. Did you find any particular restaurants or activities that you enjoyed while in Hoi An? Hi Sophie. Hoi An was just awesome. Our favourite day among many was the bike tour. We visited a fishing village, fish market, pottery and weavers, simply amazing and we joined in with everything. We visited Lune performing centre and saw Teh dar, what a great evening that was. We ate at many restaurants during our stay, the vietnamese food was simply delicious, throughout Vietnam. We will definitely be trying many of your recipes, thank you for posting them and thank you for your reply, its very much appreciated. We are going back to Vietnam next year, can’t wait. I’m sorry about my late reply. It may be a little embarrassing but it seems I don’t know about Hoi An as much as you :). The Lune Performing centre looks really nice and it seems to be a new attraction added recently. I will definitely go to a performance there when I’m in Hoi An later this year. I’m really happy to hear that you are thinking of going back to Vietnam next year. I’ve heard so many stories of people visiting Vietnam and not wanting to return… Thanks for sharing your traveling experience with me!